Una idea un viaje is the fresh blog we opened by the end of 2012 and kept growing like crazy since then. Una idea un viaje is the site where we tell what to see and what to do in all the great places we’ve been to. Una idea un viaje gives cool travel advice and helps on creating fun and adventurous trips. Una idea un viaje creates original content. Una idea un viaje is just us: photography, videos, art, stories, ecoturism, nature, adventure and lots of passion! And we’re ready to go for more! 2016: BlaBlaCar features our blog. 2017: Selected as one of the best travel instagramers by Stylight. 2014: The Hindu mentions our seat for KeralaBlogExpress. Eva is personally interviewed by Mayalam Manorama and press such us Kerala Tourism site, New Indian Express speak about the blogtrip. 2015: Mundiario newspaper highlights our article regarding Elephant Camps in Thailand. 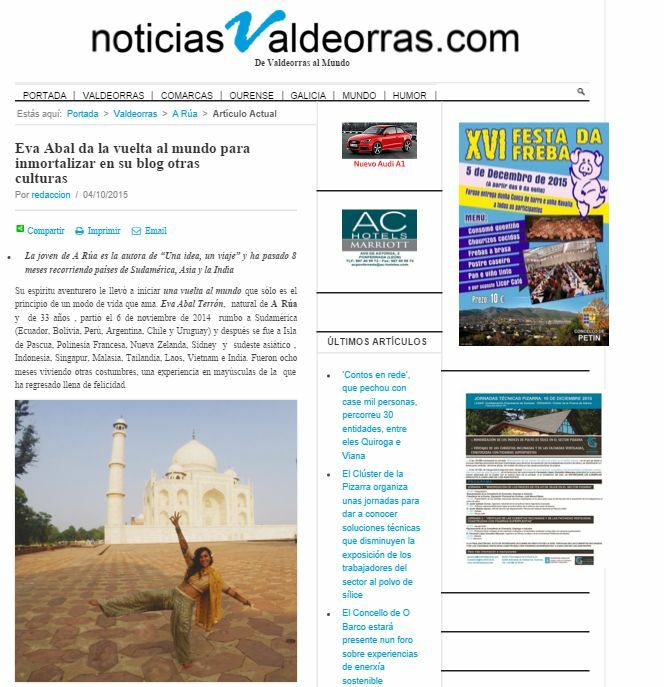 2015: Diario del viajero recommends not to miss our experience in Rajastan, India. 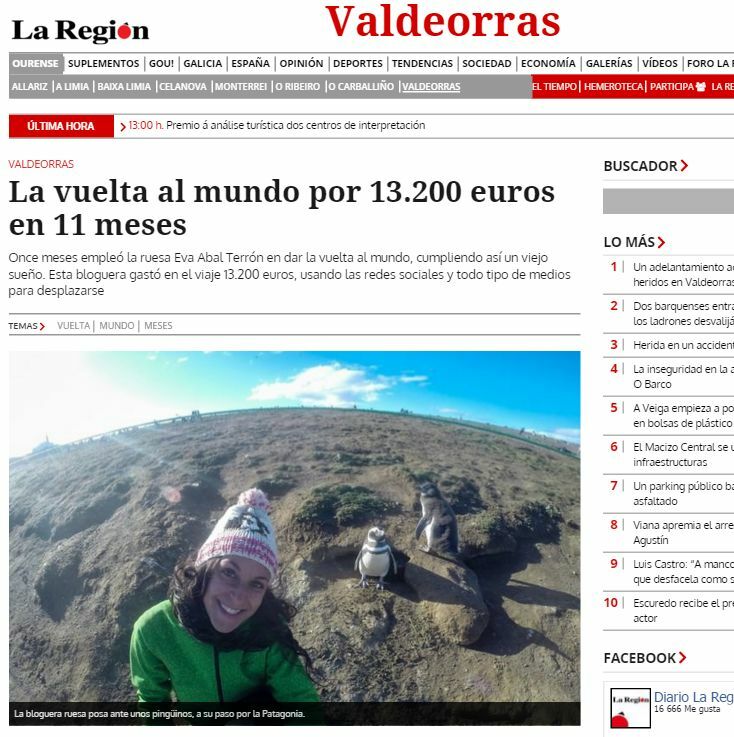 2015: Newspapers as La Region and Noticias Valdeorras interviewed Eva about her round the world trip. 2015: Radio interviews as in Levando Anclas (Radio Euskadi) or El Canto del Grillo (RNE) to know more about Eva’s RTW trip. 2015: Eva is invited by Ourense University to give a speech to students about Collaborative Tourism. 2016: Featured in Faro de Vigo among others while visiting A Veiga Starlight destination. Also here. Venachile found us as inspirational to encourage people to leave the confort zone and travel the world. Lagarto Rojo asked us to name one of our favourite not-well-know places in the world. In Cogeelvuelo we explain one of our experiences couchsurfing. We provide our vision of Mares Vivas Festival collaborating with A World to Travel. Tips for travel on a budget? We tell you our secrets in Sin Parar de Viajar. Out-of-the-beaten-track experiences in Asia. Lonifasico. 2016 – 2017: We keep on reaching our audience, being every week on the top 10 twitter influencers in A Coruña, according to Klout measurements. WE help, YOU can ask. WE are always available to travel, YOU just give us a destination. WE grow rapidly, YOU will see.